Blitz Hybrid A/C Filter - Dezod Motorsports Inc - Home of the automotive performance enthusiast since 2002. The worlds first photocatalyst feature for ill-smelling odors with anti-bacterial characteristics. 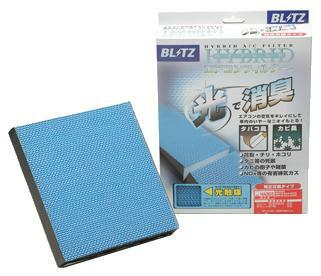 The Blitz Hybrid A/C Filter is a powerful dust and pollen removal filter. It is reusable, you can clean your filter by just rinsing and drying it. The filter itself removes tobacco smells and mold to clean the air. This effect can be maintained with periodic maintenance of your filter, it is a direct stock replacement.